The new iPad may not be as classy as our favourite, the iPad Pro 9.7, but it's a top pick for the price. If you're expecting miracles from the new iPad, you'll not only be disappointed, but you also need to change your mindset. The new iPad doesn't include any fancy new tricks, or features we’ve never seen before, or anything like that. But what it does is take our favourite everyday tablet, make it a little bit faster, a little bit cheaper, and give it even better battery life. So good is it, that'll surely be vying with the iPad Pro 9.7 at the top of our best tablets list. New iPad vs iPad Pro 9.7 - which is best for you? The new iPad is the replacement for the iPad Air 2 at the lower-price end of Apple’s 10-inch tablet range and that should give you a good idea of where this is aimed at - those who want a non-Pro iPad for everyday use, but who don't want to plump for the iPad mini 4 (which now has more storage). The upgrades to this model come with a surprising downside: it’s thicker and heavier than the iPad Air 2. It’s pretty weird to see Apple add bulk to a product, but this iPad is the same 469g weight and 7.5mm thickness of the original iPad Air. That’s a weight increase of just 32g, and a more noticeable 1.4mm thickness. While we're always obsessed with our tech having the smallest, thinnest designs possible, even we have to admit that this is… fine, really. So the dimensions and weight are the only main downside, and even that comes with a bonus, in that this has a bigger battery than the Air 2 – and, in fact, bigger than the 9.7-inch iPad Pro. Which is expecially interesting when you pair it with the new processor, which is an Apple A9, as seen in the iPhone 6S. 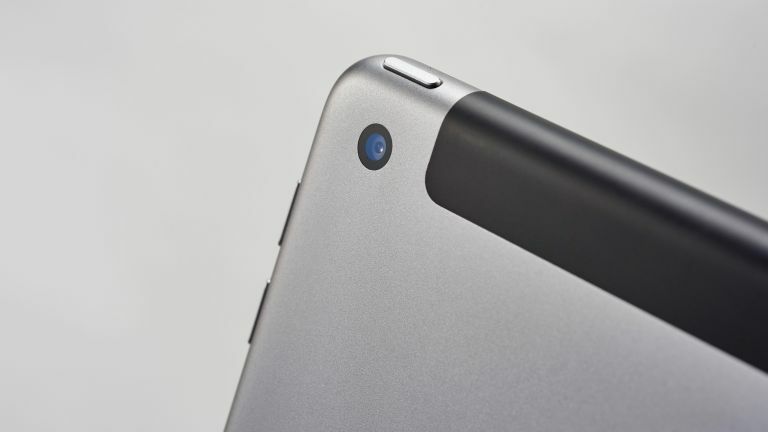 It’s not, you’ll note, an A9X, which is what the iPad Pro models run – a beefier version of the same chip. This means you’ve got a power-sipping phone processor with a battery that’s paired with a battery nearly five times larger. The main power draw on a tablet is the screen, and the iPad 5th-gen (as Apple is calling it, apparently pretending that the Airs didn’t happen, a bit like when Superman Returns just skipped over the existence of Superman III and IV – except the Airs were actually good) has a slightly brighter screen than the Air 2, so you’ll still get around the standard 10-12 hours of use from it, as you do from other iPads. There are a few other minor disappointments to note: we’d love it if the vastly improved speakers from the iPad Pro had made it over, and the camera is pretty lacklustre. All this might sound like we’re a bit down on the new iPad, but that’s only because its improvements aren’t the flashy kind. It’s exactly what we liked about the iPad before, but cheaper and faster… and it comes with 32GB of storage as standard, which is great for most people. Or you can get 128GB for an amazingly reasonable price as well. The A9 processor is a good step forward from the A8X in the iPad Air 2, despite being a phone chip, rather than a dedicated tablet one. It’s a dual-core chip, and despite being slower than the iPhone 7’s A10 chip, it’s more than fast enough for everything you probably want to do. Apps don’t hang, web browsing is fast, everything is totally fluid, and it comes on instantly from sleeping. It’s only got 2GB of RAM, but with the way iOS manages apps, this doesn’t really get in the way, or slow things down the way it might on a laptop or Windows hybrid tablet. If you want to create or edit an 8K image, then you’ll want something beefier – the Pro, or the Samsung Galaxy Tab S3, or just a laptop. In our tests, the new iPad does work out as one of the longest-lasting tablets around. It’s good for 12-13 hours of video at mid-level brightness, and nearly as much from regular light use such as emailing and browsing the web. We think only the iPad mini 4 was as good for battery life, and that had a much smaller screen. Obviously, games or other really intensive tasks lower the figures a lot – more like 6-7 hours. The difference over an iPad Pro isn’t totally transformative, but it can mean an extra hour of use in some cases. The screen is 9.7-inches, with a resolution of 2048 x 1536 – pretty much what you expect from an iPad. There’s nothing fancy about the screen – you don’t get the wide colour gamut or TrueTone display from the iPad Pro, or HDR support like the Galaxy Tab S3. It’s more like the Galaxy Tab S2 (which it’s about the same price as). It’s just a beautiful, detailed, bright screen that we have no complaints about for the cost. We mentioned the Tab S2 there, and that’s really the main competition for this iPad. They’re both a little over £300, at the same size, with nearly identical displays. The Tab S2 is noticeably thinner and lighter (by nearly 100g), but remains plasticky and less premium-feeling, and with generally weaker battery life. The gulf between iOS and Android is nowhere near as large as it used to be, and for a lot of the things you might use this for, the apps are much of a muchness across platform. With iOS you tend to get better support for new software features – or even hardware features, such as the Touch ID sensor, which can be trusted to keep your banking apps as safe as your notes about what to get your partner for their birthday. (and is just super-useful for unlocking the thing, or using Apple Pay in apps). Yes there are a few minor quibbles, but broadly speaking this tablet is an absolute no brainer and the price is so good for what you get. Even though sub-£100 tablets abound, this is far more capable than most lower-priced competitors.